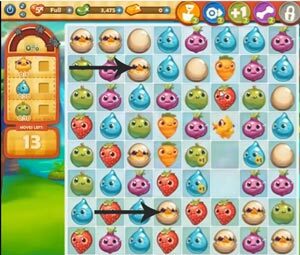 These Farm Heroes level 27 cheats and tips will help you beat level 27 of Farm Heroes. 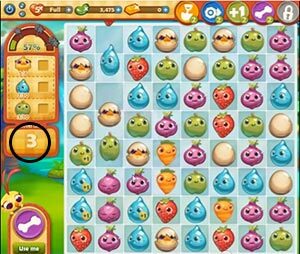 The objective of Farm Heroes level 27 is to collect 6 chicks, 10 droplets, and 10 green apples in 15 moves or less. For this level, it’s important for you to collect all of the chicks you need first, as they are the biggest drain on your moves. In order to make a chick, you have to make a lot of smart moves. Make a match of three whole eggs in order to get a cracked egg. Match three or more cracked eggs together to get a chick. Fortunately this level starts you with a bunch of cracked eggs to work with. While the chicks are important, you can’t afford to forget about the other cropsies altogether. When you need to bring cracked eggs together and other crops stand in your way, try to make combinations with droplets or green apples. This will clear up space, collect you more crops, and bring your cracked eggs close together. As always, you need to be really careful about each move you make. 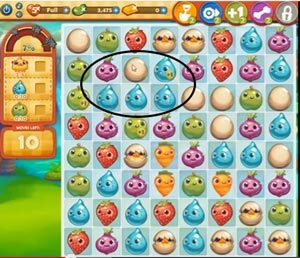 You only have 15 moves at your disposalin Farm Heroes Saga level 27, so you shouldn’t be making a move unless it collects you more droplets, green apples, or chicks.